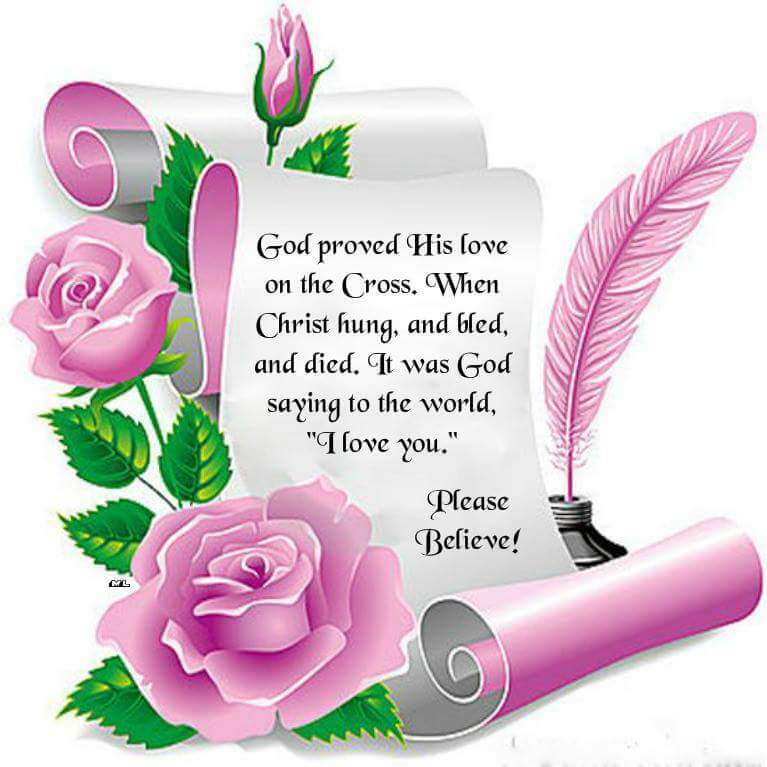 “For God so loved the world that He gave His only begotten Son, that whoever believes in Him should not perish but have everlasting life. For God did not send His Son into the world to condemn the world, but that the world through Him might be saved”. (John 3:16‭-‬17). “Greater love has no one than this, than to lay down one’s life for his friends. You are My friends if you do whatever I command you”. (John 15:13-14). “Let this mind be in you which was also in Christ Jesus, who, being in the form of God, did not consider it robbery to be equal with God, but made Himself of no reputation, taking the form of a bondservant, and coming in the likeness of men. And being found in appearance as a man, He humbled Himself and became obedient to the point of death, even the death of the cross. Therefore God also has highly exalted Him and given Him the name which is above every name, that at the name of Jesus every knee should bow, of those in heaven, and of those on earth, and of those under the earth, and that every tongue should confess that Jesus Christ is Lord, to the glory of God the Father”. (Philippians 2:5‭-‬11). “He is despised and rejected by men, A Man of sorrows and acquainted with grief. And we hid, as it were, our faces from Him; He was despised, and we did not esteem Him. Surely He has borne our griefs And carried our sorrows; Yet we esteemed Him stricken, Smitten by God, and afflicted. But He was wounded for our transgressions, He was bruised for our iniquities; The chastisement for our peace was upon Him, And by His stripes we are healed. All we like sheep have gone astray; We have turned, every one, to his own way; And the Lord has laid on Him the iniquity of us all. He was oppressed and He was afflicted, Yet He opened not His mouth; He was led as a lamb to the slaughter, And as a sheep before its shearers is silent, So He opened not His mouth”. (Isaiah 53:3‭-‬7). “For the love of Christ compels us, because we judge thus: that if One died for all, then all died; and He died for all, that those who live should live no longer for themselves, but for Him who died for them and rose again. Therefore, from now on, we regard no one according to the flesh. Even though we have known Christ according to the flesh, yet now we know Him thus no longer. Therefore, if anyone is in Christ, he is a new creation; old things have passed away; behold, all things have become new. Now all things are of God, who has reconciled us to Himself through Jesus Christ, and has given us the ministry of reconciliation, that is, that God was in Christ reconciling the world to Himself, not imputing their trespasses to them, and has committed to us the word of reconciliation. Now then, we are ambassadors for Christ, as though God were pleading through us: we implore you on Christ’s behalf, be reconciled to God. For He made Him who knew no sin to be sin for us, that we might become the righteousness of God in Him”. (2 Corinthians 5:14-21). “Then Jesus said to them again, “Most assuredly, I say to you, I am the door of the sheep. All who ever came before Me are thieves and robbers, but the sheep did not hear them. I am the door. If anyone enters by Me, he will be saved, and will go in and out and find pasture. The thief does not come except to steal, and to kill, and to destroy. I have come that they may have life, and that they may have it more abundantly. “I am the good shepherd. The good shepherd gives His life for the sheep”. (John 10:7‭-‬11). Because,Christ gave His life for us,then Christ Lives In us.Therefore , we should live for Him. +We are crucified with Christ so Christ can live in us. +The life that we are living now should reflect Christ in Every way. +In doing these things we bring Praise, Honor and Glory to Christ. Hallelujah! “Therefore humble yourselves under the mighty hand of God, that He may exalt you in due time, casting all your care upon Him, for He cares for you. Be sober, be vigilant; because your adversary the devil walks about like a roaring lion, seeking whom he may devour. Resist him, steadfast in the faith, knowing that the same sufferings are experienced by your brotherhood in the world. But may the God of all grace, who called us to His eternal glory by Christ Jesus, after you have suffered a while, perfect, establish, strengthen, and settle you. To Him be the glory and the dominion forever and ever. Amen. [1 Peter 5:6‭-‬11]. This entry was posted in Daily Message and tagged Love beyond measure, unlimited love.